I assume that by “supports transit”, they mean something dense that has people going in/out during the day and evening. Based on existing land uses (or rather disuses), the red zone is most likely. Matt McNeil on what’s great about Hopkins. There is quite a bit of snobbishness looking down of it I’ve caught via Nextdoor. It’s a great opinion piece. I’ve always loved Hopkins’ downtown (or at least its potential), and I’m glad that LRT is helping bring it back. It’ll be interesting to see if it keeps its affordability over the next decade or so. 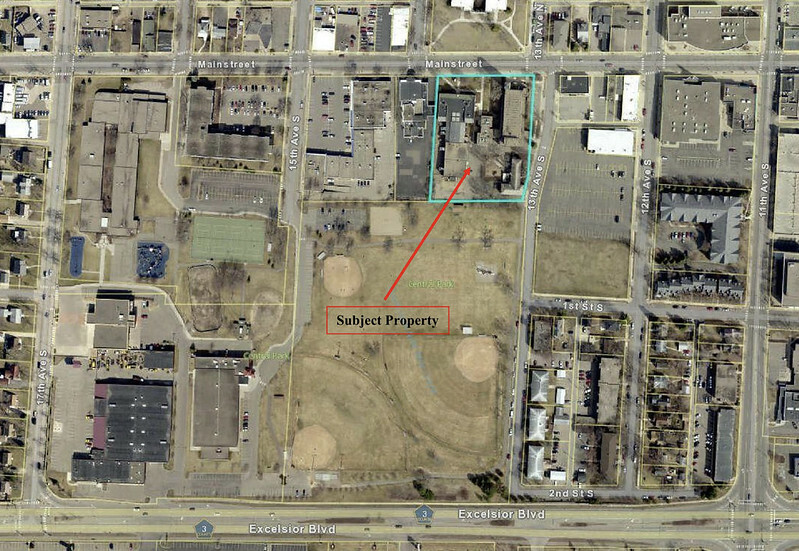 Was browsing through the Hopkins city website and stumbled upon a project I haven't really heard before under Current Projects named the "East End Redevelopment"
The projects page doesn't really tell much, only states a study was initiated several years ago and gives a small site plan so I wouldn't be surprised if this project is stuck in limbo if not scarped. But does anyone have any more information on it? The East End project is more along the status of a wish, a comprehensive plan. It was completed over a decade ago to help guide future redevelopment for when SWLRT station arrives, is up and running, and if someone came along with redevelopment proposals. One give away for how long ago this was done is the south side of Excelsior Blvd still has the buildings from before Hennepin County came through and literally bulldozed half of a small commercial district in order to stroadify Excelsior with 50 mph drivers. The biggest stumbling block is that Edco owns something like 50% of that area (right in the center) with no intent to move or sell, they said they like their location “thankyouverymuch”. If Edco can be given the right price they may change their mind. But the city has said at many of the Blake Road and SWLRT events I’ve attended that the East End study will guide what Hopkins will want to see. The street layout is already being tossed aside, however, by the SWLRT Blake Station design. Back when this was done expectation was that the station would be on the 43 Hoops property (it’s owned by the County) but during the LRT design process many in the city asked for the station to be moved to the East End Study side of the tracks (where the pawn shop is) for a few reasons. 1. The 43 Hoops site is quite out of the the way of any visibility from the pedestrian realm on Blake. 2. Siting the station at the pawn shop could help stimulate something close to the sort of redevelopment envisioned in the East End study that was done a few years before. There were never any proposals that inspired the East End Study, and haven’t had any proposals since. But the East End Study will guide what the city wants to see happen. still find it a little weird the have it listed under current projects if the East End study is more of a guide to what Hopkins wants to do for development. Though since its being treated as a guide I wouldn't be surprised if they used the findings from the study for another area in the city. The Driskill’s supermarket building in downtown Hopkins was just sold for double the price it sold for 5 years ago. “Hopkins is super hot,” said Robert Lunieski, owner of Lunieski & Associates in Bloomington. A professional appraiser and longtime investor, he owned the property in an entity named Brainers Minimus LLC. The Driskill’s property wasn’t formally on the market, he said, but he received such strong interest in it that he decided to sell. Interesting. I do remember Driskill"a being remodeled 2 or 3 years ago now, only thing I miss is the old photographs of Hopkins hanging on the walls. Any word on what their gonna do with the property? Kinda hope they keep it as a supermarket count a few specialty markets, it's the only one inside the city's boarders. Minnehaha Creek Watershed District emailed that the demolition of the Cold Storage site has fully completed. This year the next phases are stormwater improvements coordinated with the master developer, then redevelopment of the site can proceed. Mainstreet rezoning updating coming. Hopkins has a Downtown Overlay District that restricts which types of uses are allowed, but staff noticed that within the overlay district some business zoning allowed auto-oriented uses (B-3 General Business) while another business zoning use didn't (B-2 Central Business District). 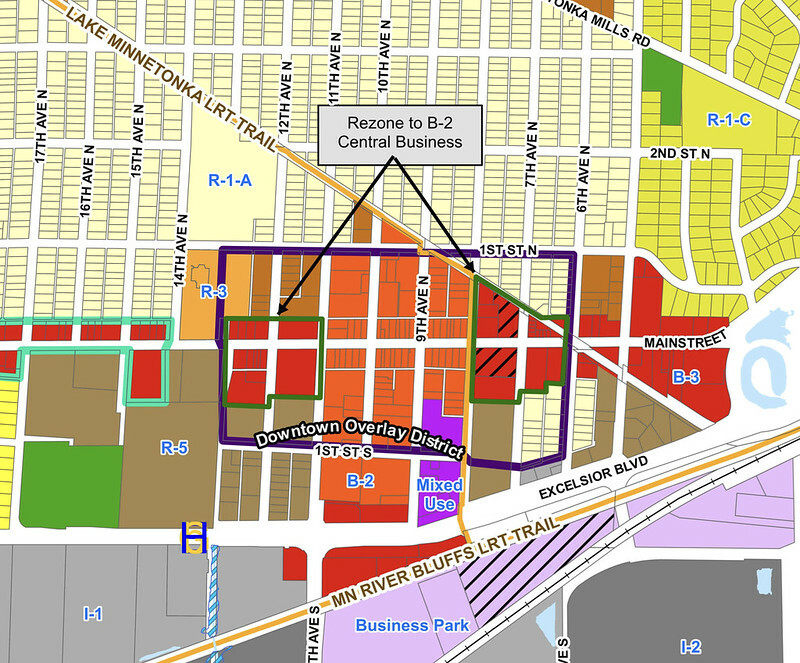 To remove the confusion, conflicts, and inconsistencies, the city is proposing a rezoning of every B-3 within the overlay district to B-2. Here's a map. Extra benefit, B-2 Central Business District also allows properties to no longer worry about providing off-street parking. With all the public lots and the municipal ramp smack in the middle, this is seen as no source of concern. I honestly wish they'd take the opportunity for the Downtown Overlay District to be extended two blocks to the west and one block to the east. Baby steps, and revise expanding it in five more years towards the LRT station and even further east and west. New school coming to fill the St. Joseph school building on Mainstreet. Chesterton Academy wants to fill the old St. Joseph School building, recently it was filled by a performing arts school that outgrew its space in 2016. Chesterton Academy is a Catholic school with 170 students. I just learned that the large parking lot to the east and open space next to it are owned by the St. Gabriel church. The staff of the school will park in that massive lot. wonder if there's any cause to warrant extending the overlay district south past Excelsior. there's a small strip of general business between 11th and 8th that will be right next to the downtown station and of course there's the honda dealership and supervalue that could be redeveloped. The Downtown Overlay doesn’t allow auto-oriented land use, and that strip and dealership are full fledged auto-oriented. I’m certain the overlay also doesn’t allow an existing business to expand though it would be grandfathered. It could be very unkind for the city to “go after” those properties. Spreading the overlay too far from the historic core might not be popular. I think a lot could be accomplished by first allowing those properties to be redeveloped and rezoned to multi use or B-2 as property owners get around to it. Then after those properties have been redeveloped to CBD-like uses, then extend the overlay to include them. I thought the historic core used to be a little more south than its current location but i could be wrong. I see your reasons behind why the district should arbitrarily extended the district past excelsior and agree with them, though I might still argue extending that extending it one block south to the north side excelsior, but I might need to look at the exact details of the district to fully commit to that thought. MCWD and Kraus Anderson, the selected master developer, have agreed to part ways from developing the Cold Storage site after six months. They could not agree to a vision and purchase price. I’m an outside observer to these things but would have thought the vision was something that they had to agree to to be picked in the first place. Huh. Biz journals on it too. Sounds like the MCWD was expecting a certain price and wasn’t getting it, with KA perhaps suggesting what MCWD could do to make it worth that price? MCWD’s work on the creek amenities has been quite impressive, so I think this is probably a good thing. They seem to know what they’re doing. Anondson wrote: I’m an outside observer to these things but would have thought the vision was something that they had to agree to to be picked in the first place. Huh. I’m guessing there was a basic contract to remove the cold storage, and beyond that a Letter of Intent or some such for the housing & amenities, that broadly outlined what they were agreeing to, but left the details to later, so as not to delay it. Apparently, expectations were out of line, or something changed (or KA has bigger fish to fry or whatever). I’d love details on the ways the visions differed. I’ve never seen anything published for the public. The Minnehaha Creek Watershed District is a very well funded entity. The projects that they work on are quickly expedited and they have been quickly converting industrial uses over to parkland along the 20 miles of shore land adjecent to the creek and the watershed that stretches 178-square miles to help filter runoff water before it enters the Mississippi. This years budget is $15M. If only the state government took the Minnesota River water runoff issue as seriously as the metro does for the Minnehaha we'd be far better stewards of the communities down stream.